Full name Saul Hudson (born July 23, 1965), more commonly known as a stage name Slash, is a guitarist an American-English. Slash is the former lead guitarist of Guns N Roses and current Velvet Revolver as a lead guitarist. Slash was born in Hampstead (London), England July 23, 1965 and was raised in Stoke-On-Trent, Staffordshire, England. His mother was a black American father and British Caucasians. Her parents are engaged in the arts. Slash's mother, Ola Hudsons, is a clothing designer who worked on David Bowie, and his father is an artist who contributed live ensembles for famous musicians including Neil Young and Joni Mitchell. Since 11 years, Slash moved to LA with her mother and for a year he was still a Immigrants in America. Before long the family was reunited in LA where Slash transition that much different in the Southern California area. Hence, long hair, jeans and a t-shirt so its flagship although at the time the child is not in accordance with his age As with the new kid in school. Instead she became a very young artist while in his home. He also hung out with my friends most of the master's class artist. Unfortunately, in the 70's bercarai parents and he lived with his grandmother until he was able to understand what is happening in the family. That's when Slash started to explore BMX join up with his club won in one game. At the age of 15-an his grandmother gave him a guitar that supposedly only stringed one! From there he began to explore Led Zepplelin, Eric Clapton, Rollin Stones, Aeroshmith, Jimi Hendrix, Jeff Beck and Neil Young. For him he considered that his album Rocks Aerosmith really changed his life. Not to mention a very valuable opportunity for him to play alongside Jeff Beck, Eric Clapton, Lenny Kravitz, Paul Rogers, Michael Jacson, Brian May, and many more. School became a mess ever since he often skipped school and play guitar all day outside. His school was chaotic, but still a profit improved social relationships. The other children mennganggap Slash quite interesting and fun. Reportedly the name 'Slash' is the title of his friends because he was always doing things quickly and move on to something else. Because of that he was called 'SLASH'. Slash also began jamming with a lot of young bands until he dropped out of school when he was grade II. He hoped, waiting for the next level in the band LA. There, he too met with Steve Adler, and formed Road Crew, and then they were both looking for a good singer. Then they were both met with Izzi Stradlin were playing the sound recording W.Axl Rose was feeling fit, plus Duff McKagan who answered the ad "sought basst" Slash him. Then formed Guns N 'Roses. And they fly high. But the void GN'R did not make it too long staring at the house, but yanpa tired of trying to form a new band Slash and Matt Sorum, Gilby Clarke, Mike INEX, Eric Dover formed SLASH's Snakepit and recorded their debut album It's Five O 'Clock Somewhere. The band rose to continue to live by doing a small tour-tour and played in night clubs. Could also be her first album platinum. 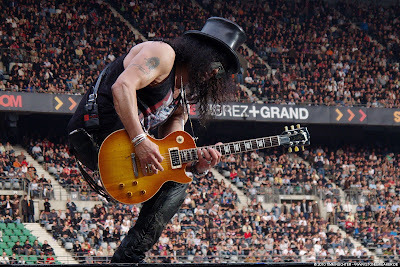 Unfortunately, discussions about the continuation of the band with Axl no meeting point, because GN'R Slash wanted to maintain a rock band while Axl wants leads tecno music / industrial with GN'R. Wow.. obviously it will not connect. And finally in October 1996 Slash quit GN'R was Axl plenipotentiary to the ownership of GN'R. But Slash had said that he would be willing the band together again original GN'R remained rock music. Apart from GN 'R, Slash deep formation in SLASH's Blues Ball who played in the club more around the California area. Slash then back on again SLASH's Snakepit her with the release of Is not Life Grand. Unlike the initial formation, this time the snake cage conceptualized and well planned in terms of quality, personnel and future plans. Third album reportedly still in the recording process.